The Friesian is a Dutch breed and it is said that, like the cows, it comes from the Friesian Islands. 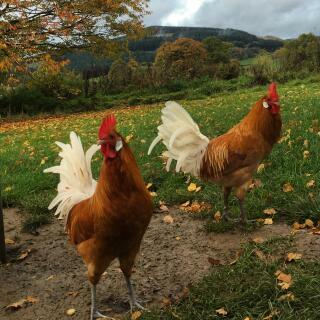 It is a very old breed of bird and excavation that has taken place on the Island has shown that the Friesian chicken was around some 1000 years ago though its arrival in Great Britain is quite recent. We did not see it till the 1980s. The Friesian is a small breed but at the same time a very good layer. It can produce around 230 eggs per year. Being small they do not require so much feed to be given to them. This breed is not a broody one. The standard colours of the Friesian are gold pencilled, silver pencilled and chamois pencilled. The chamois is the most unusual coloured of them all and the most attractive. 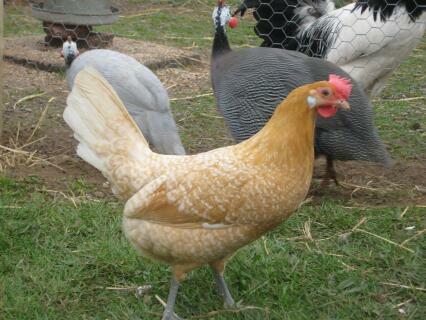 It is different shades of yellow and buff and has a pattern that runs through each of its body feathers. This is not found in any other breed of chicken. All of the colour varieties have eyes that are orange in colour, earlobes that are white and legs that are slate blue. Purchased our fresian (Jess) at two days old she is very entertaining always looking for food, if we leave our back doors or windows open she along with our appenzeller (lilli) break in and raid our dogs bowl! They can fly extremely well but have never attempted to leave our garden. 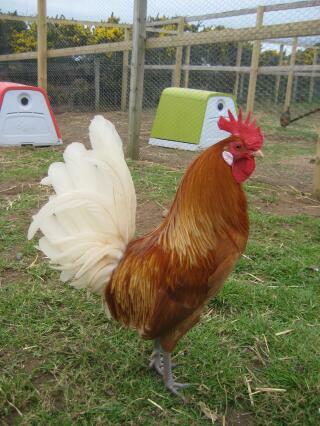 I would recommend this breed for adults and older childen but not suitable as a pet for young children, our ten year old daughter recently got a little to close and Jess pecked her eyelid. 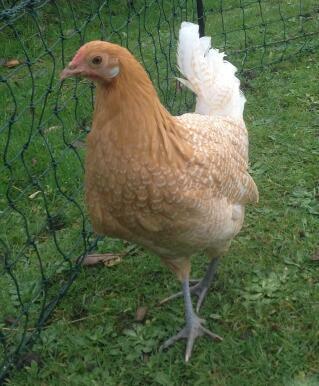 Jess came into lay in December at seven months old and lays approx five lovely white eggs a week. These birds are. "Birds with a character". If you have ever owned any - you will be for ever attached to them. Although nimble on their feet and flightly, they show great intelligence and curiosity. They follow you around, fly up to the coops you are cleaning to see what you are up to and and are great to hand feed. They create very little mess in their coops, eat little and very fox friendly. By Fox friendly I mean - they can avoid the fox by flying out of their reach. I keep a few breed lines and let them all out together, the cockerels are like naughty boys playing together - no bickering at all - between hens or cockerels. 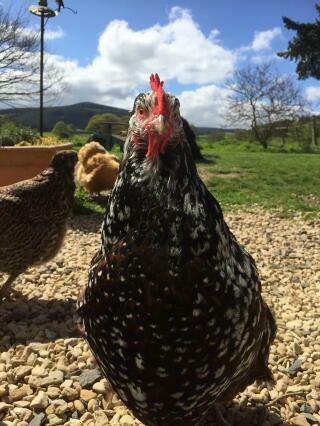 They are quite vocal birds - so dont expect a cockerel to be quiet just because its small! 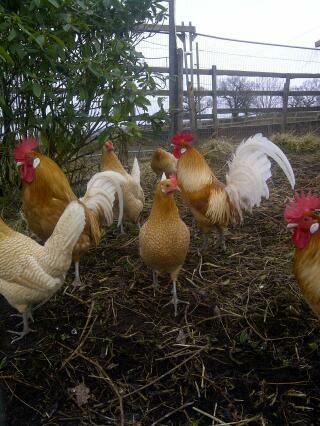 Never having kept chickens before I chose this breed as they attractive and not as big as some breeds. Every day is a delight with my posh chicks. They were a bit skittish at it first but were soon bribed with mealworms treats. They are not laying yet as they re only 16 weeks old to be honest I don't care if they don't. I can't wait to get home each day they are a great stress relief. As pets they are perfect, I have hours of fun watching them running around the garden and chasing the resident robin who is making he most free meals on offer. I have one Friesian and two at 6 weeks old to join her. The oldest is among 14 large hens and holds her own well, able to get out of trouble when necessary. She can squeeze under the garden gate but once she is in the garden, she does not cause such destruction as her fellow hens. 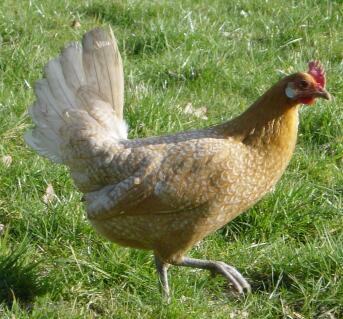 She is quite a wild little hen and definitely not tame, despite being handled frequently as a youngster. She started laying quite early, eggs slightly smaller than a small egg and pure white which she produces almost 6 days out of 7. I can recommend Friesians highly both as a decorative and as an egg producer but I would not say that she was suitable as a pet for children.